What is AZBambi Décors all about? AZBambi Décors is our attempt to inspire and help others customize and personalize their Airstream interiors...particulalry newer Airstreams that don’t require renovation or restoration. transformed to fit our mood—or even our travel destination! we borrowed the “basic black dress” concept from the fashion world—that is, beginning with simple, plain basic “sets” (consisting of dinette slip covers, curtains, bedspread, window valances, pillow shams and throw pillows)—that we could create a number of very different themes simply by replacing two or three components of the basic “set” using coordinating fabrics to carry out the theme...a sort of “mix and match” concept. This allows a nearly endless combination of décors without having to create a whole new set for each theme. We show you examples of this through THE BASICS link below. Click on THE BASICS below to explore the “basic black dress” concept and how we’ve applied it to a number of décors for our Bambi... Click on DECORS to view some of décor themes we’ve created and how we’ve varied them by using The Basics. Click on OTHER GOODIES for other utilitarian items we have developed for our Airstream. We’ll add items as ideas emerge. 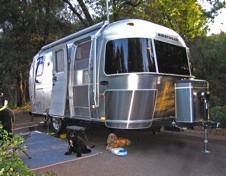 We hope this site will serve as inspiration to help you make your Airstream your own, and put your creative side to work! We’d love to hear from you if we’ve helped inspire you to get creative with your Airstream ... just email us at AZBambi@TBRich.com. And have fun! We also invite you to visit AZBAMBI...ON THE ROAD AGAIN for travel logs of our trips with our Airstream.